UPDF FC players share a moment during a recent friendly. Courtesy photo. FOOTBALL–Two-time defending league champions KCCA FC will hope to reignite their title defence away to UPDF FC at Bombo tomorrow. 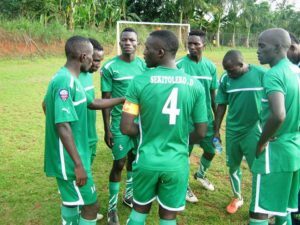 The Kasasiro boys played out a goaless draw at home to newly promoted Maroons FC on the opening day as many of their star players perfomed poorly. The Kasisiro boys are set to do without Ibrahim Saddam Juma, Jackson Nunda, Muhamed Abdallah and new signing Faizol Malangu for tomorrow’s encounter, all being injured. Benjamin Ochan will replace man of the match (against Maroons), Charles Lukwago and new signing Kaddu Patrick set to come in for Tito Okello in the starting line up. “They have a good coach in Moses Basena who is currently with the National team so that says alot about them,” he added. John Kayanja, UPDF FC assistant coach, did not hide his admiration for the Kasasiro boys. “We respect them but after our first day loss, we very much want maximum points in our first game at home and hopfuly we can achieve that,” Kayanja said. UPDF FC have two injury concerns with defender Julius Malyangumu and Moses Lukwata still out nursing injuries they sustained during a motor vehical accident. KCCA drew their first game of the season at home to Maroons while the Bombo based side (UPDF) lost in the opener 2-1 against URA. Last season, KCCA won the reverse fixture 1-0 before winning again 1-0 at Lugogo. UPDF have won only two of the last 12 meetings with KCCA. UPDF have lost four of the last six games at home to KCCA. KCCA have not conceded more than twice in a single game in any of their last 14 league matches against UPDF. KCCA’s away form has not been good lately, winning only one in the last five games in all competitions.